It’s salad season at Chiot’s Run, the garden is lush with greens of all kinds and thus salad has been on the menu every single night for the past few weeks. In order to avoid the salad doldrums, we’ve been topping them with a variety of delicious toppings and dressings. The first week, I made roasted red pepper dressing with leftover brine from my Fire Roasted Red Peppers. I hate wasting anything, especially when I go to all the trouble and expense to use organic and homegrown ingredients. To make this dressing, I added an egg yolk (which I always add to my dressings to help with emulsification), salt, pepper to the brine in the jar, then I topped it off with olive oil. Then I shook it until it was combined; easy as that, seriously. We topped our salads with: home cured mission olives, goat milk feta cheese from a local farm, maple glazed walnuts, and some home canned pears. All the flavors were simply perfect together! The following week I had a good batch of dill that needed used up and buttermilk was quickly overtaking our fridge. I decided to make a buttermilk herb dressing. 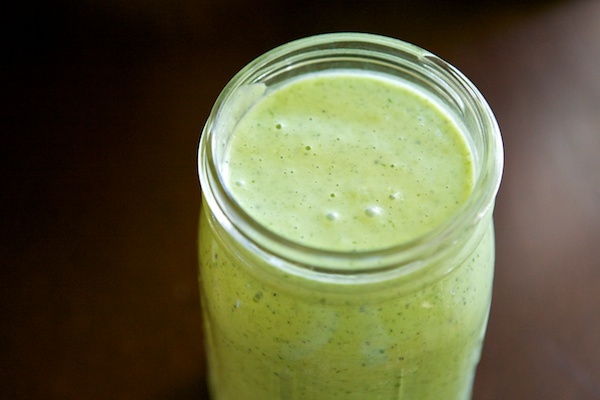 In my blender I combined a handful of each: dill, parsley, a handful, chives, along with some freshly ground salt, pepper, 2 cups of buttermilk, a quarter cup of apple cider vinegar, a Tablespoon of honey, a couple cloves of garlic, two egg yolks and 2 cups of good of olive oil. I blended them until the herbs were finely chopped and everything was emulsified. I ended up with a quart of this herby dill buttermilk dressing. 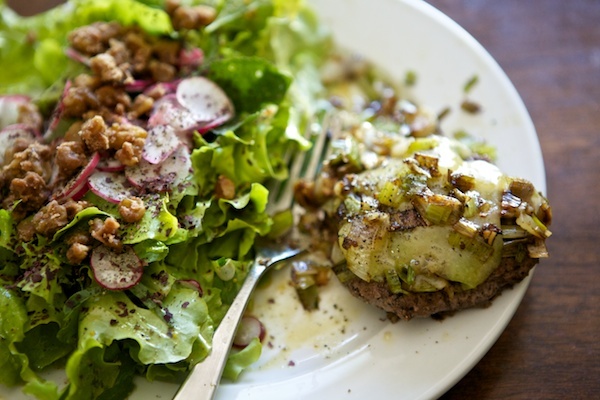 This dressing is so fresh and light, perfect for spring. It would also be really fantastic on fish or boiled new potatoes as well. Next up, I’ll be making a balsamic vinaigrette because the strawberries are coming on in the garden. There’s nothing I love more than strawberries with balsamic vinegar. We’ll probably also add some sliced almonds as well. Do you ever make your own salad dressing? 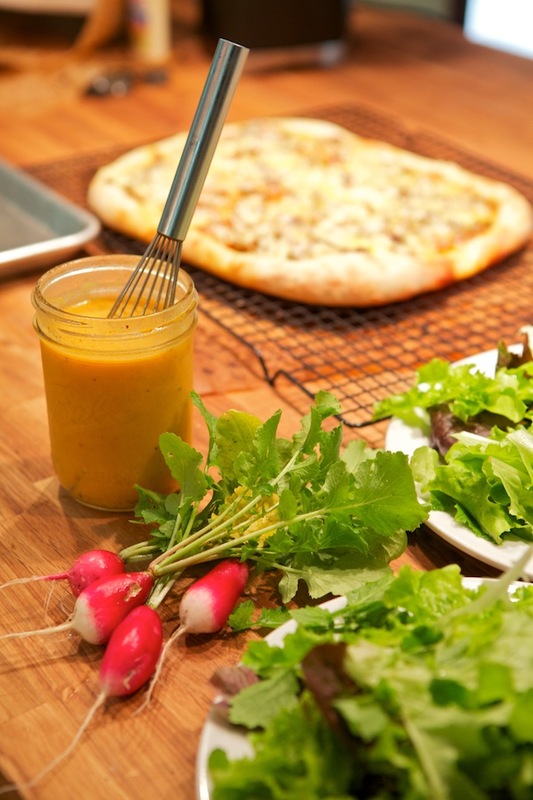 What’s your favorite kind of dressing and salad topping combo? Olive oil, balsamic vinegar, salt and pepper, shake and done. Because I am lazy. If I’m REALLY feeling lazy, I just put the stuff directly on the salad without even shaking. I always make my own salad dressings! My Mom always did so I guess I just followed suit. They’re SO easy and taste so much better than store bought. One rule of thumb though, quality ingredients, quality dressing. p.s. my favorite to make is Blue Cheese. MMMMMM – I love blue cheese too, sadly the farmer’s market hasn’t had any recently. My next endeavor is to source some local milk [hopefully not ultra-pasteurized] and make some butter & buttermilk…! [thank you NDiN!] then I can make that dill dressing too! Yum yum yum! Normally I do a simple mustard [from you! :D] and some olive oil with honey to make a honey mustard mixture… or a simple garlic vinegar/thyme/pepper/oil mix. I just harvested the rest of my spinach to make room for summer veggies, so this post is all sorts of inspiring! Mmm. I can’t wait for dinner! How long do these typically last in the refridgerator? That salad looks amazing! !